I don’t usually end up getting to write about my lunches, but this was just too enjoyable of a perfect fall lunch to resist — warm and hearty before heading out to my favorite cafe for a long afternoon of work. I made this soup last night, quickly and distractedly while getting ready to go out, and it turned out fantastic. I wasn’t expecting anything mind-blowing, since I had forgotten to pick up soup veggies of any kind while at the grocery (I usually like to throw in at least carrots or celery), but you know, when you have nothing on hand but some onions and garlic, this really does the trick. I’m a bean soaker (of course you could use canned black beans for this as well, I just don’t like the aluminum taste so I always have plenty of dried legumes on hand). So I tossed 1 cup of dried black beans into a pot of water yesterday afternoon, and since black beans only take but a few hours to soak, they were ready by dinnertime. This soup starts with half a yellow onion and 3 huge cloves of garlic, chopped and minced, respectively, sauteeing in your soup pot, in a few tablespoons of olive oil, on medium-high heat. After the onions have turned translucent, dump in the beans (soaked, but not yet cooked), a handful of sun dried tomatoes, and 4 cups of homemade chicken stock. If you’re using commercial stock or bullion you probably don’t need to salt it too much more, but as the beans cook, taste the broth and salt as you see fit. Bring all this to a boil, and keep simmering at medium-high until the beans have finished cooking. Although half an hour of this should be enough, the longer you let it simmer, the more the beans will break down and give you a wonderfully thick broth. I even took a potato masher and helped it along at the very end, not wanting to get my blender dirty. A puree is definitely not necessary here. For an October soup, chunks are a great thing. Top it with some shredded sharp cheddar! And to balance it out, a piece of toast (rosemary basil whole wheat bread, baked yesterday!) 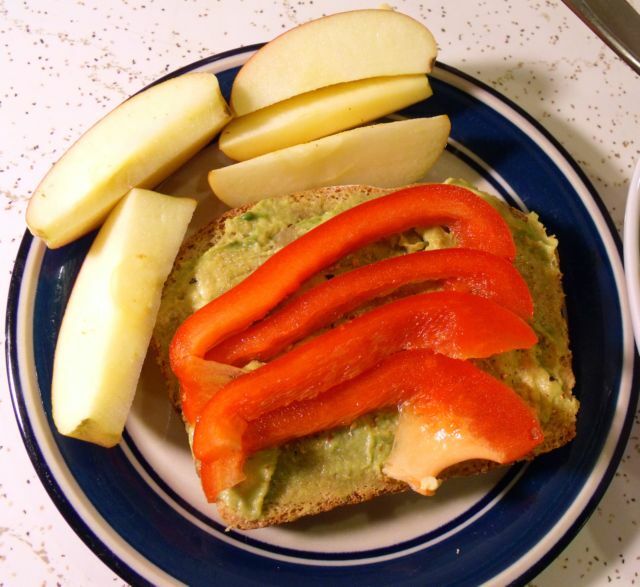 with a thick layer of avocado, salt, pepper, and sliced red pepper, and a Fuji apple on the side.